At EBSS we pride ourselves in being able to offer one on one private lessons for all of our water sport activities. Unlike most surf schools in Bali, we do not teach in large groups. Instead we provide one on one instruction from the start of the lesson on the beach until you are in the water. At all times you will have a dedicated instructor by your side helping and monitoring your progress. EBSS surfing programs are designed to accommodate absolute beginners as well asintermediate and advanced surfers. The basic initial lesson is approximately 1.5 hours. Starting from EBSS headquarters we take a short boat ride to an outlying reef where you will learn in small breaking waves. We provide all equipment necessary and expert guides and instructors. EBSS is home to the Indonesian National windsurfing team. Whether you are an absolute beginner or have some experience, our expert instructors will have you standing and sailing on your first one hour lesson. A fantastic chance to try this new and fast growing water sport! If you already have experience come rent our equipment and paddle around the shallows or head out to the reef to catch a few waves. If you are a beginner our expert instructors will get you up and paddling on your first one hour lesson. Oka is the country’s only 4x Olympian, twice Asian Champion and undefeated national windsurfing champion. Had he focused on surfing he would have most likely been the champ at this also. Some say he is the best surfing instructor on the island.. come make a booking and find out. He guarantees to get you up and standing on your first lesson. 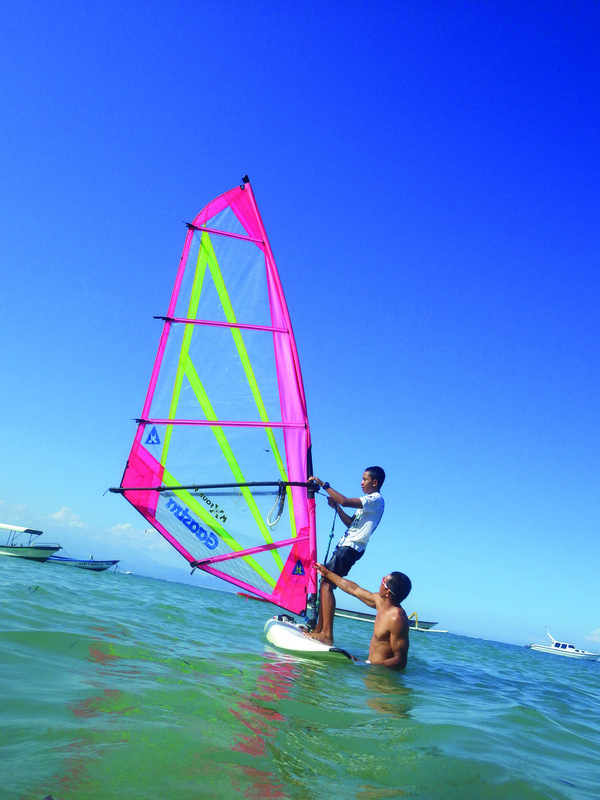 Whether you would like to learn surfing, windsurfing, or sailing on our Hobie cats, Oka will provide expert instruction.